The forth event of the UNIQA Hungarian Cross-country championship, the Gyulai Várfürdő Cup between 22-24. July was a really exciting rally with rain and mud! Together again with the polish competitors this CEZ event had everything to be a real rally-raid. In Gyula it’s always a very nice event with the service park on the main road going to the center of the historical city. 35 cars and 15 quads starting on the first selective near Gyula on Friday, it was not a superspecial but a very good training with its 15 kms. Fastest was Szalay but only with 2 seconds in front of Fazekas, and with 6” advantage on Korda. 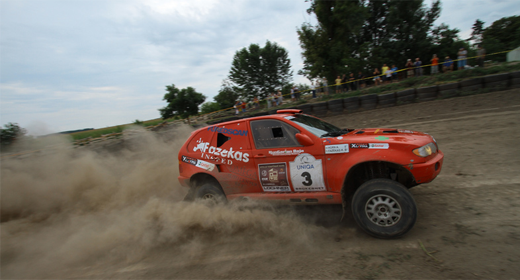 The best Polish driver, Wasiak Slawomir finished on the 6th place with 50” behind Szalay. After this short selective on Saturday and on Sunday the competitors had to fulfil 9 more stages with a total of 650 kms (330 kms SS). The first day was a little more easy with fast tracks and a very interesting autocross-circuit where there were hundreds of spectators to see the rally. The most sightful movement was also here, when a new competitor, Tibor Piskolty rolled over because of the big speed, but after he could continue racing. The end of the day it was Fazekas on the first place with 35” advantage on Szalay and more than 4 minutes on Korda. And after… during the night a heavy rainstorm fell down and turned the tracks into icerink! On Sunday everything could happen but the competitors was pushing hard to achive the best places. Szalay became the first, and until the last selective the rally was calm. But when the competitors thought that it’s almost the end of the event, they lost control and had a lot of mechanical problems. An other new couple, Ferenc Vörös and László Attila Boros run an overall time at the beginning of the day (they were 1 minute faster than Szalay!) but after they tiped into a ditch with the Opel Antara. They threw away the 5th place also… Pál Lónyai was the other competitor who quit in the last stage, he lost his front landing-gear after jumping out from a hole. Also Szalay had to stop on the selective, he had a puncture, but he was also lucky because even Fazekas had a problem with the v-belt. At the end Szalay won his 3rd rally this year with this new engine after the Silkway Rally. On the second place finished Korda, the third Fazekas. 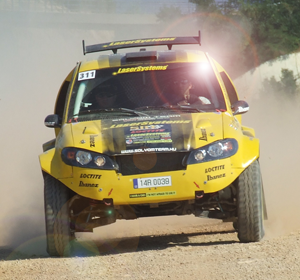 The leader of the Hungarian cross-country committee and the organizer of the Gyulai Várfürdő Cup, László Liszi was forth on this event with a diesel Mitsubishi Pajero. The winner of the TH category is again József Bognár and Tamás Baturin (Nissan Pickup), the best quad biker was Zoltán Hangodi with his Yamaha Raptor. Next event will be part of the FIA Worldcup, the HunGarian Baja will be held in Győr between 25-28. August.